Is Barack Obama a Racist or does He Just Hate the Military? Like millions of Americans who watch the nightly news, I was moved by President Obama’s eulogy for the nine Christians who murdered by Dylann Roof while attending a Bible study at Emmanuel AME Church in Charleston, South Carolina. Understand that I am not naïve. I know that Obama’s presence in that church was as much about politics as it was about comforting the grieving congregation. After their split, Pastor Jeremiah Wright said of his long-time congregant that Barack Obama had no religion except politics and that everything he did was for political gain. That said, at least the President showed up in Charleston to offer comfort in a situation that called for his presence. But what has made an even bigger impression on me than Obama’s presence at the Emmanuel AME Church is his absence from any functions honoring the four Marines and one Sailor who were recently murdered by a terrorist in Chattanooga, Tennessee. In fact, President Obama has been absent without leave so often following the deaths of military personnel one is forced to wonder—in view of his moving performance at Emmanuel AME Church—Is Barack Obama a racist or does he just hate the military? Since taking office, President Obama has shown nothing but disdain for the military. Correspondingly, he has shown a definite racial bias in his responses to several race-related incidents that have occurred during his time in office (e.g. Cambridge police incident, Trayvon Martin killing, Ferguson riots, Baltimore riots, etc.). In fact, it took a week of public pressure to convince the president to do something as simple as issue an order for flags to be flown at half staff in honor of the military personnel murdered in Chattanooga. But I doubt the grieving families felt honored—not when flags were lowered late and reluctantly. With his waving of a coffee cup at a smartly saluting Marine sentry to his claims that domestic terrorist attacks are just workplace violence to his ham-fisted, on-going DOD budgets cuts, President Obama has demonstrated nothing but disdain for the military for almost two full terms in office. The President of the United States is not just president of domestic programs, as Barack Obama appears to view himself. 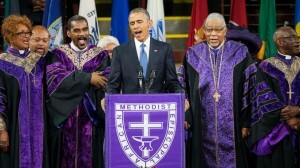 Did the President go to Charleston and deliver that moving rendition of “Amazing Grace” only because those grieving were black? I hope not.